A defense that had played so well in the second half of every game finally cracked on Sunday night, sending the Eagles to their third loss of the season. This one came in overtime as the host Dallas Cowboys won the coin toss, took the ball and drove the length of the field for a touchdown and a 29-23 victory that solidified their spot atop the NFC East with a 6-1 mark. A victory by the Eagles (4-3) would have pulled them even in the standings. 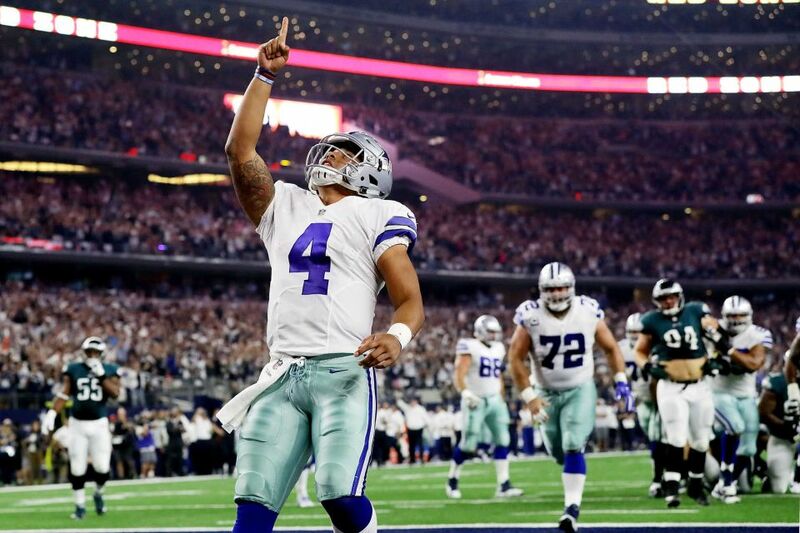 Cowboys rookie quarterback Dak Prescott scrambled out of pressure and tossed a 5-yard touchdown pass to tight end Jason Witten to win it, ending a thrilling, see-saw contest in which the momentum shifted their way for good after a botched offensive sequence by the Eagles in the fourth quarter. The game-winning drive also saw the Cowboys pass up a short field goal to convert a fourth down. On third-and-8 from the Cowboys 30-yard line with 7:17 remaining in regulation and the Eagles clinging to a seven-point lead, quarterback Carson Wentz recovered an errant shotgun snap and threw to Darren Sproles for a loss of 6 yards. Then, instead of having having Caleb Sturgis, who kicked a 55-yard field goal at the end of the first half, attempt a 53-yarder, they punted and never were able to score again. In the meantime, the Cowboys solved an Eagles defense that had been dominating to that point. They went 90 yards on 11 plays to tie it when Prescott hit Dez Bryant with a 22-yard touchdown and Dan Bailey added the extra point. More than three minutes remained, but the Eagles weren’t even able to sniff field-goal territory, much less the end zone again, going three-and-out before having to punt from their 31 right after the two-minute warning. Despite forcing a Dallas punt at 1:24, they went backward — from their 20 to their 9 — with the help of an offensive pass interference penalty on Dorial Green-Beckham and a sack that forced them top punt it back with 46 seconds to go. If not for a heavy pass rush by Brandon Graham that forced an incompletion and a sack by Connor Barwin, the Cowboys might have moved into position to win it in regulation. In overtime, they hit on four plays of 10 yards or more, including a 24-yard pass to Cole Beasley. But the most crucial play was a 2-yard gain on a sneak by Prescott after the Cowboys decided to go for it on a fourth-and-1 from the Eagles’ 28. Five plays later, Prescott wheeled out of a collapsing pocket, scrambled to his left and found Witten wide open in the end zone.